Share ideas for dressing up for afternoon tea. Is your favorite tea-time outfit a silk caftan, flannel jammies, or a dress with proper hat and gloves? Do you enjoy wearing tea prints to tea? Or do you prefer something more elegant? Lace and ruffles? A feathered hat? Long pink gloves? Satins and silks? Cotton comfort? Jeans and a t-shirt you say? That's okay --- share it all here. Pictures of you in tea-time costume are welcome! But, if you are not brave enough to share a picture of 'you', simply share something you think would be FUN to wear to tea. 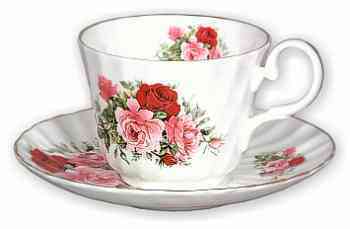 Remember, a tea can be anything from a formal afternoon tea --- to tea in the park with a friend. It's whatever it means to you! I'm having so much fun with this blog-a-thon. Thank you for hosting. I love the photos you've included for this weeks post. They're all so beautiful! I remember my grandmother and all the darling 50's styles she wore. I think a variation of them is coming back. Such a fun topic this week! I am go eager to see what everyone has come up with. Good morning LaTeaDah, I enjoyed putting together my post this week. I always enjoy visiting each person who takes time to post, what a wonderful group of people out there. I appreciate all the work you have done as well...thank you! what an absolutely lovely site for a tea drinking, home loving, garden loving woman like me! if I were to choose, it would be my eileen fisher cotton black pants(so comfy) and my cashmere sweater with my french soles... jeans are too restricting, dresses are too much trouble although a skirt is another idea....hmmm, now you have me thinking! Okay, I'm back on the tea cart this week! I fell off last week with no "handmade" linens to show and tell~ sorry about that! This has been such a fun blog-a-thon. Thanks again for putting it all together. I love the outfit in your post picture! This week was a challenge for me after seening some of the creative posts of others. I am a gal who wears black pants or Capris with a variety of tops. My girlfriends and I refer to black pants as our "uniform." I really enjoy the posts you prepare for each week's theme. Thank you for creating and hosting this fine event. Tea in the park sounds nice! Love your photos this week,,,as usual! Well, I finally found something to wear to tea. My dear Ms. La Tea Dah, how you do challenge me with these tea themed posts! Love the photos in your post. Thanks for sharing! My tea outfit has been posted. Thank you for hosting such a fun event! I love how you have used the theme of tea, and come up with so many different ways to share! It took me awhile but I finally came up with something. :o) Now I'm off to read the other links and visit some blogs. I think it is hard to find a good tearoom. My post whines about that very issue.